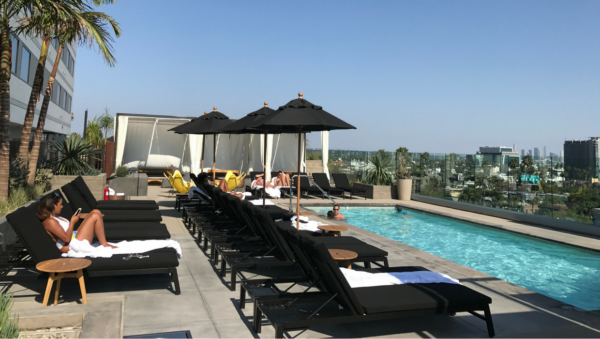 Soaking up the California sun at the Kimpton Everly rooftop pool. Twice a year Kimpton Hotels offers a special promotion that is available to anyone that is staying at a Kimpton property. To participate in the Kimpton Summer Password promotion, all you need to do is say the secret password at check-in, then wait for the awesome people at Kimpton to surprise and delight you with some incredible goodies. What is the Kimpton Summer Password? Do I need status to use the Kimpton Summer Password? What kind of goodies will I get? Which Kimpton Hotels can I say the Secret Password? The Kimpton Summer Password for 2018 is “out of office”. Super simple and yet so dreamy! You can use the Kimpton social password throughout the summer until September 3, 2018. Just remember to say secret password when checking in at the front desk. Ok, even I have forgotten to say it when checking it, so don’t worry about it if you forget as well. Just stop back by the front desk and tell them the Kimpton summer password and they’ll still hook you up with something awesome. In the world of travel, the more status you have the better the goodies you will receive. And so many hotels treat the occasional guest like they’re lucky to be staying with them… and not the other way around. Hotels should consider themselves lucky that we’re spending our hard-earned money at their property! With the Kimpton Summer Password, whether this is your first stay, your 10th, or you’re a top-tier Inner Circle Member like me, everyone can use the secret password to receive something awesome. The goodies from the Kimpton Summer Password will vary. One of the things I like is that every Kimpton Hotel will treat the Kimpton secret password promotion differently. At the Kimpton Everly Hotel in Hollywood, California, we received free valet parking. If you’ve ever been to Los Angeles, you know that parking can be crazy expensive. This saved us around $40 for the night. It’s always sunny in California. At the Kimpton Journeyman Hotel in Milwaukee, Wisconsin, they offered a grab bag of wrapped goodies that you can select from. When we unwrapped it, the gift was basically just a trinket that we eventually threw away, but it was still exciting to pick a little gift. And some Kimpton Hotels give you a choice of a free drink at the bar or a dining credit to use during your stay. If you stay at a Kimpton Hotel this summer and use the Kimpton Summer Password, please let us know what goodies you get in the comment section below. Although Kimpton is now part of the IHG family, only Kimpton Hotels participate in the Kimpton Summer Password promotion. Every hotel within the Kimpton family will give you something cool when you use the Kimpton secret password while checking in. And, the summer is still young, I may poke around and see what other Kimpton Hotels I can squeeze into our packed summer of adventure. Do you have plans to stay at one of the more than 60 Kimpton Hotels this summer? Let me know in the comment section below which Kimpton property you’ll be staying. Extra goodies for no reason other than it is fun is one of the reasons why I love Kimpton Hotels. Every property is unique and not some cookie-cutter hotel, which makes you want to visit every Kimpton to experience the little touches that set them apart. The Kimpton Summer Password is only here for a short time, so make sure you book your reservations now and use the Kimpton secret password “out of office” when checking in. Ahhh, bummer that you missed it. I’ll be there this weekend and am looking forward to chilling out on the rooftop pool and splashing around with the kids. Glad you enjoyed it. The staff has always treated us incredibly. Never rains in California…except the two days I was in LA. Enjoy the pool….I didn’t get to! What are the odds, right? Hopefully, we have better weather the next time you visit! Kimpton Allegro, in Chicago around Memorial Day. Got a couple $10 off dining or bar coupons. Made the difference for us. Instead of seeking out a neighborhood place, we visited “312” in the hotel for breakfast and it was great. Win-win. How did you like the Allegro? I haven’t stayed there yet. Would def like to. Kimpton is smart to entice you with those discounts. Even with a lower price point, I’m sure they still made money and better controlled the experience to ensure it was a positive vacation for you.